What are the drivers, benefits and challenges companies face when implementing cloud BI? What are the most popular cloud BI and data management use cases and tasks? Which BI and data management components are organizations typically running in the cloud? Are customers opting for a public, private or hybrid cloud infrastructure? What role do vendors play in cloud BI? The drumbeat of cloud computing began more than a decade ago when Salesforce.com launched one of the first front-office applications to run entirely in the cloud. Its success has spawned a host of imitators in just about every nook and cranny of the business applications market. The rush of cloud-based applications is shifting the gravity of data from on-premises data centers to cloud platforms. Was 2016 the tipping point? It appears that 2016 may have been the tipping point for cloud computing. Oracle, SAP, Teradata and IBM have joined front-runners Amazon, Microsoft and Google to launch cloud platforms that host a variety of their own and third-party applications. These vendors are working with customers of all sizes to help them understand the value of cloud computing and develop cloud migration plans. BI and data management vendors have not been immune to the allure of the cloud. There are several pure-play cloud BI and data management vendors, and most other BI vendors offer cloud-only products or extensions that support hybrid computing environments. Vendors now recognize that many customers want to exploit the advantages of cloud computing—faster deployments, minimal IT involvement, no capital expenditures and elastic computing. And they are investing accordingly. For the past six years, the adoption rate for cloud BI has hovered around 30%. Our current research shows a significant uptick in cloud BI and data management deployments. As data gravity shifts to the cloud, BI and data management is following suit. This report tracks adoption of the cloud by companies that have BI and data management programs. 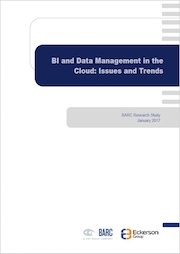 This study follows on from BARC’s 2011 global survey on Cloud and SaaS for BI and data management. It is based on a survey of 370 BI and DM decision makers and professionals worldwide across all industry sectors. The survey was conducted in late 2016.